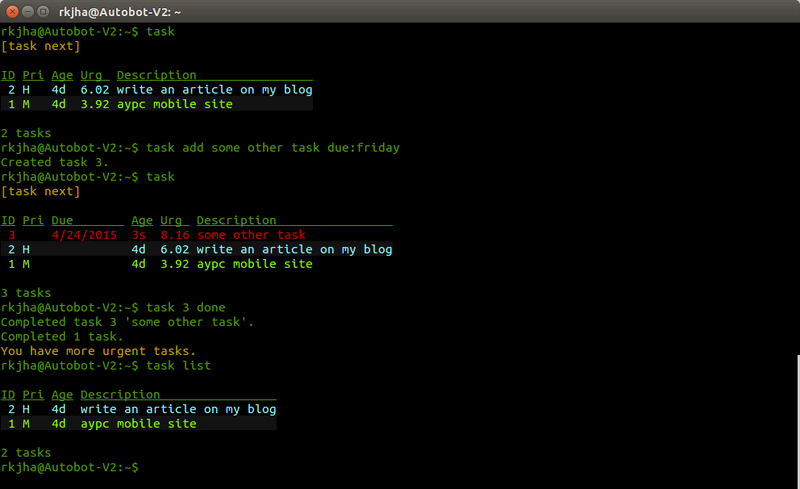 Taskwarrior is a command line app for managing your todo list. It’s lightweight, simple and fast. If you spend lot of time on terminal (as a developer or system administrator) then constantly switching to a web app or another GUI based todo app may not be very productive thing to do. In that case, you may want to try a simple command line application instead. If you’re using a GNU/Linux distribution such as Ubuntu, then it’s already there in your package repository (I’ve tested on Ubuntu 14.40 LTS) under the name ‘task‘. For older version or other distributions you may want to download it from official site. If you want to know more about the features read the man pages (man task) or read some tutorials on official website.